Daimler contended during the event that it could begin commercial production of its autonomous trucks nearly immediately, but there first must be a legislative framework put into place to allow for their use. This has already begun, with the Vienna Convention regulating international road transport in Europe being amended to allow for the use of autonomous vehicles. However, each nation must then amend its own laws to allow their use. 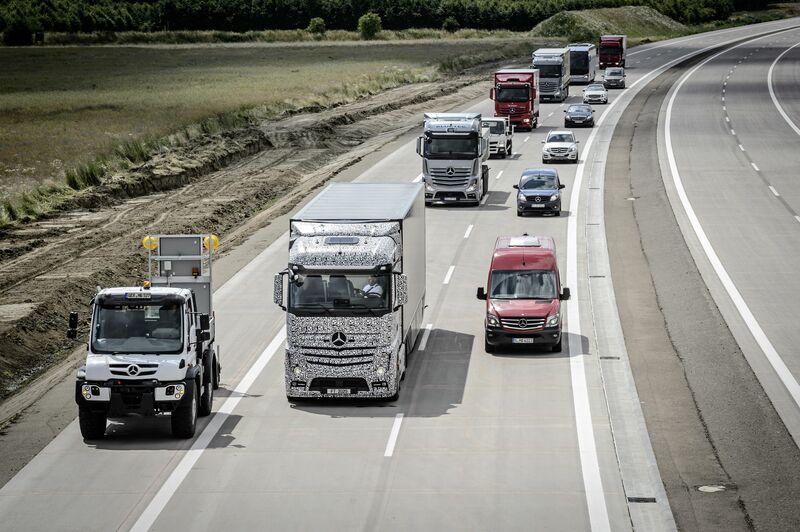 By showcasing the capabilities of its autonomous trucks in front of some 300 journalists, politicians and other stakeholders, Daimler is hoping to help along the dialogue that will precede such changes. It is hopeful these trucks will be on European highways by as early as 2025, maybe even sooner. Here in Canada, I wouldn’t hold my breath. Our lawmakers are so leery of any new technology – 6×2 axle configurations with the latest load-shift capabilities and full-sized trailer tails, to name a couple – that I suspect they’ll want to see this technology play out in Europe for a few years before following suit. And there are some uniquely Canadian considerations as well. How about snow and ice? Officials admitted the lane markings must be clearly visible for Highway Pilot to function, so that could pose some problems but they’re already working out some possible solutions. How about wildlife? one Twitter follower asked me. Good question. Traditional radar can only detect metallic objects. However, the Daimler system is much more advanced, utilizing a combination of radar, cameras and V2V (vehicle-to-vehicle) and V2I (vehicle-to-infrastructure) communications. I believe these early concerns can eventually be overcome given the sophistication of the technology being deployed.